Motorola is currently hosting a couple of solid deals on their current line of premium products that you may be interested in. 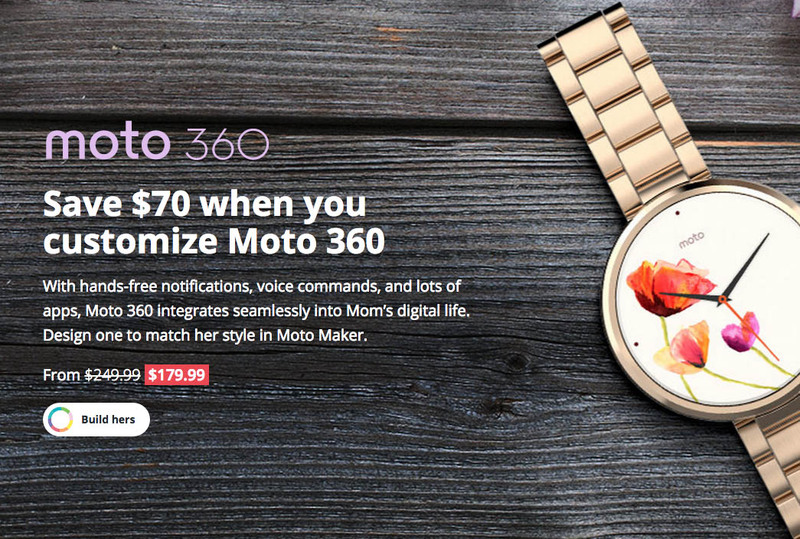 First, the Moto 360 has been slashed by $70 to $180 in celebration of Mother’s Day. That’s the same price that Google is currently selling it, but Motorola lets you customize one through Moto Maker, which means you could choose from a variety of colors or bands. The second deal is for a bundle that includes the Moto X and wireless Sol Republic headphones. For $399, you can get both, and the Moto X can be customized through Moto Maker. At $399, Motorola is basically slashing $100 off the price of the phone, but then also tossing in free $200 wireless Bluetooth, on-ear headphones. The Moto X may not be on the level of the Galaxy S6 or G4 at this point, but that’s still a hell of a value buy there. Question of the Day: Why Aren't You Buying the LG G4? Why are You?